An oriental Kung Fu expert named Wong Han (played by Bruce K.L. Lea) travels to America at the invite of his long-time friend and former Kung Fu school training partner only to learn his friend is now dead, apparently the result of a suicide. Suspecting foul play, Wong Han sets out to bring down a gang of strange characters he suspects are responsible for his friend’s death but when he attempts to do so, there’s also quite a few unexpected surprises awaiting our hero. 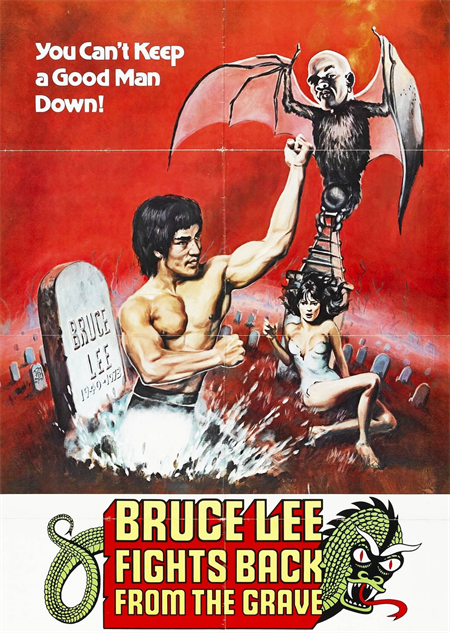 Despite the title referring to Bruce Lee, he actually has nothing whatsoever to do with this movie apart from an extremely cheesy, silly opening introduction title sequence in which we see a man resembling Lee jump out of a grave with the headstone behind him bearing Lee’s name. What this movie is actually about is a man coming to America trying to avenge his fallen friend while protecting his deceased friend’s last belongings. There he befriends a beautiful young woman named Susan (played by the delectable Deborah Chaplin) who tries to help him in his quest. However, the gang of colorful thugs, a true assortment of weird characters if there ever was one, are after him and Susan for some reason unknown to Wong Han and go all out in their efforts to bring them down meaning Wong Han has to constantly fight for his own survival while also trying to protect Susan. As you can tell, the basic plot for this movie isn’t half-bad. The Kung Fu fighting scenes featuring Bruce Lea, who throws a mean-looking kick, also proved much better than expected although they fall rather short in comparison to the one and only Bruce Lee. The major problem here is that the movie seems to go on a bit too long, the pace feeling a little too slow, which isn’t helped by the fact there’s too much obvious filler footage of people simply driving vehicles from place to place. Also the colorful villainous assortment of characters Wong Han tries to bring down never evolve beyond anything other than one-dimensional caricatures.